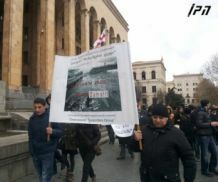 TBILISI, DFWatch–The building of a controversial hydropower dam in a mountainous region of Georgia may be further postponed, if the company behind it fails to submit the required documents in time. The planned Khudoni hydropower project is located in Svaneti and will affect a cultural landscape that is unique in a European context. If realized, the dam itself will flood the village Khaishi as well as other settlements. Several thousand people will see their birthplace and cemetery destroyed. Opposition to the project is strong, both locally and among environmental activists. Trans-Elektrica, the company behind the project, is due to submit an environmental impact assessment (EIA) by September 17 and send it to either the Ministry of Economy or the Environment Ministry, but according to daily newspaper Rezonansi, neither ministry has yet received the report. Tamuna Sharashidze, spokesperson for the Environment Ministry, told the newspaper that they should receive the EIA by September 17-19, but she doubts that Trans-Elektrica will manage to finish it in time. According to the environmental group Green Alternative, Trans Elektrica first ordered an EIA from the non-governmental organization CENN, but the Environment Ministry made about one hundred remarks to this report and the company broke off its cooperation with CENN. It is not known who is currently writing the EIA for Trans Elektrica. Trans Elektrica’s previous deadline for submitting an EIA was spring, 2014, but it was postponed until September 17. Now it seems the deadline has to be postponed further.